Salvation Mountain is an adobe and straw art installation created by Leonard Knight (1931-2014) in the California Desert north of Calipatria near Slab City. With its brightly painted bible verses it may seem that it only interests the religious, but Salvation Mountain has a broader appeal than one might think. In 2000, the Folk Art Society of America went so far as to declared it “a folk art site worthy of preservation and protection”. California Senator Barbara Boxer described it as “a unique and visionary sculpture”, and “a national treasure” in an address to the United States Congress in 2002. 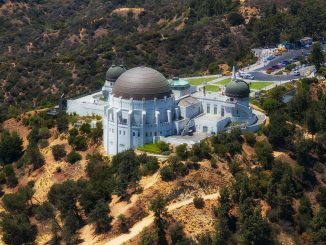 While all of the new paint added to the art installation is lead free, that may not have always been the case. In 1994, Imperial County hired waste specialists to test the soil and the results showed higher levels of lead toxicity than found in surrounding areas. A second test, paid for and chosen by Knight, determined that there was no toxins in the soil. Salvation Mountain requires constant maintenance due to the harsh surrounding environment and there is concern that the future if the site is uncertain. To keep the art installation alive, visitors are encouraged to donate paint to the small group of volunteers that maintain the site. There is no charge for parking since the site is uncontrolled, but since it is, there is also no official electricity, running water, sewers, toilets or trash pickup service. The site is so unregulated that it’s often described by locals and news outlets as a miniature enclave of anarchy. Slab City is something of a snowbird community in the Sonoran Desert, 156 miles northeast of San Diego in the California Badlands. Named for the concrete slabs that remained abandoned after the World War II Marine Corps barracks of Camp Dunlap, Slab City is a destination itself rather than a place you might happen to come across. Because the city if far from anywhere else and completely off the grid, it is largely unregulated. 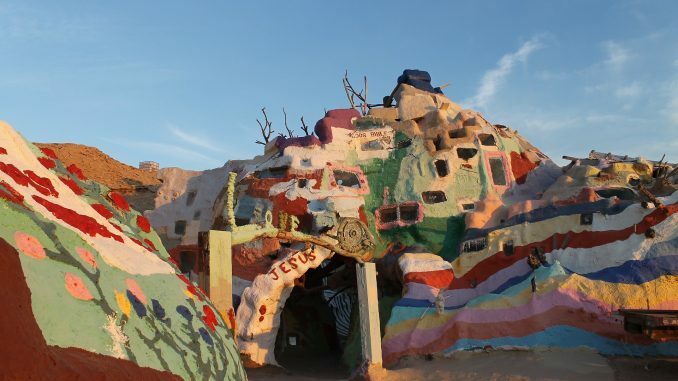 In 2012, Salvation Mountain, Inc., a local non-profit was established to support and continue the project. Knight claimed to have only ever used non-toxic and lead free paint. Leonard Knight passed away on February 10, 2014, in El Cajon. The water towers above Salvation Mountain have also been painted with bible verses but they were not part of the original artwork. The original philosophy of Salvation Mountain was built around the Sinner’s Prayer. Barbara Boxer also said of Salvation Mountain that it is “profoundly strange and beautifully accessible, and worthy of the international acclaim it receives”.